The dark lords are gathering, ancient powers are awakening, and a chill has fallen across the land. It is a time of danger and rising evil. It is a time of fear for the weak and powerless. It is a time of heroes willing to face the darkness and bring the light of hope to a realm covered in shadow. In Runebound, you and your friends play heroes in a fantasy realm full of monsters, perils, and treasure. The realm is yours to explore as you wish: Visit the Mountains of Despair, brave the Whispering Forest, or shop for magic items in the Paradash Bazaar. Wherever you go, adventure awaits you - and because the game changes each time you play it, you'll never have the same adventure twice. This is a sweet adventuring game. You start out by picking a hero at random, grab your starting gold and begin your quest for loot and experience. There are 5 unique movement dice which have graphical representations of the surrounding terrain. You must role the corresponding terrain symbols in order to move across them, or not roll at all and opt for a movement to one spot adjacent in any direction. Take quests and complete them for gold and loot, grab allys who help you in your battles, collect 3 runes or kill the dark lord for a victory. Plays in about 1-2 hours and is a load of fun for everyone, but make sure you keep your friends close and your enemies even closer, for they may choose the easier route of robbery than fighting a dragon for its rune. Aside from what Swordfish said, one of the most important thing about Runebound is that you can buy decks that can change the main objective of the game, add more items, add more encounters and monsters to fight and lastly, even give character classes to your chosen hero! This makes the permutations of the game endless and ensures the game's replayability. Love love love this game and you will too! This is a great base game with plenty of options for expansion to enhance the experience! I recommend this game for 2 to 4 players max, 3 preferable: until the end of the game, when things come down to the wire, each person can basically disinvolve him or herself during the opponents turns. In a three player game, this means the others talking not necessarily about anything related - but when you get upwards of 4 players everyone waits a considerable amount of time before taking another turn. It bogs the game down. If you play with the right number of players, it's a fun adventure game for anyone who enjoys fantasy settings in a board game form. The most RPG I've ever seen in a board game! The movement dice are pretty neat: they feature land icons that determine what type of space you can move into. In a "polite" group it turns into multi-player solitaire, with a race to the finish, but the conversation can be fun. 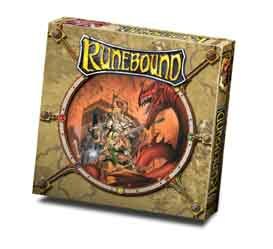 I love epic fantasy board games, and Runebound is certainly one of the best and most well known of this type. While Runebound has less player interaction than some similar games, it has a very good ability to make the players feel that they are part of a story - greatly helped by the flavour text on the many cards in the game. This is one of the few board games I've actually really enjoyed playing solo, just to see how my hero will do.